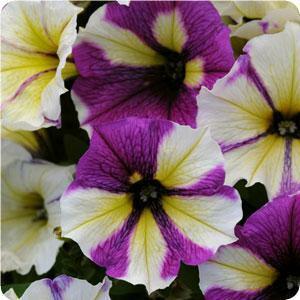 Blue A Fuse Petunia is a tricolor petunia that has a varied pattern of violet, yellow and white with a deep purple center. Each bloom is unique displaying a different color pattern which can create the look of a mixed planting. This mounding plant will look great in any planting situation but will stand out most in a basket or container. Spacing: Plant 8″ to 12″ apart. Outstanding Features: Blue A Fuse is self-cleaning and doesn’t require the blooms to be picked of like most petunias do. Tips: Keep them evenly moist and fertilize them every 2-4 weeks.